Range: Found throughout the western two-thirds of Kansas; less common in northeastern part of state. Absent from southeastern Kansas except an isolated record from Coffey County. Description: Harmless. Keeled scales; single stripe down middle of back and one on each side of body situated on third and fourth scale rows (counting from belly up); dark vertical bars on upper lips; alternating rows of black spots between stripes on body. 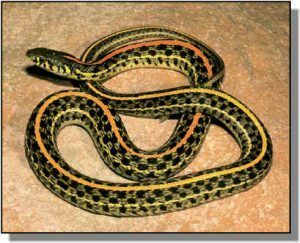 Stripe running down middle of back may be bright yellow or orange; stripes on sides are normally yellow. Belly is white, grayish or greenish, with a row of black spots down each side. In central Kansas, may exhibit a bright red color between the three body stripes. Young look like miniature adults. Habits: Prefers open grassy prairies, particularly along edges of streams, marshes, and lakes. Normally active from March to November; usually active during the day. Litters range in number from 5-60, born during late July, August or September. Feeds on earthworms, toads, frogs, salamanders, fishes and small rodents.